Bailed out and taken in by a brother she hasn’t seen in years, an Indigenous protester and her adoptive family reckon with betrayal – of love, land, and blood. 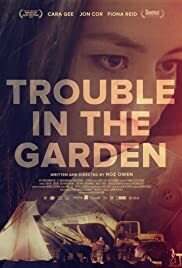 The film is appropriately entitled TROUBLE IN THE GARDEN as retesting activist Raven also known as Pippa McTavish (Cara Gee) is camped on in a tent in the garden of her surety who bailed her out and who is under house arrest in his home. Raven is trouble personified. The film opens with Pippa arrested and jailed form protesting land development on disputed Indigenous land. Arrested – McTavish. A white man, Colin (Jon For) bails her out and she has to stay house arrest with his family. The following scene has Colin putting up a real estate sign, as he sells houses under the name McTavish. It is then revealed that Pippa is the adopted daughter and Colin the son of a white family. Pippa was disowned by the father for the reason disclosed later in the film. Another of the film’s problems is its feminism and radicalism. Sure, the land of the Indigenous people have been stolen, but the white man is considered evil with no redemption whatsoever. The script squeezes in a lot of key issues. Among these include the fact that: the natives were never allowed and the government considered it a crime for them to hire lawyers till the 60’s to fight to gain back their stolen land – a point that would anger many Canadians besides the natives. One can imagine the anger of the Indigenous people over the stolen land – an issue that can never be resolved. As the saying goes, why bring it to the courts? Can one expect justice in stolen land? The script makes a twist to have the brother’s wife side with Raven. When Colin’s wife finds out about her husband Colin’s unfaithfulness to his sister, she storms out of the house and family. One would think her loyalty more to her family, especially when she is expecting a second child than side with Pippa who the audience learns has also upset Colin and the wife’s wedding reception. Actors Gee and For are good and more worthy than the material they are given. They commit to their confrontation scenes with conviction and bring enough drama to the film,. Owen is a British born filmmaker now residing in Toronto. She must have taken up the cause of the Indigenous people while maintaining her strong female saint in her filmmaking. The film boasts: Betrayal and reckoning – the issues that Raven will have to come to grips with, not to mention trying to reconcile with her brother and her well-intentioned adoptive parent. These are too ambitious and too many issues that are never satisfactorily resolved in the 70 minute movie.